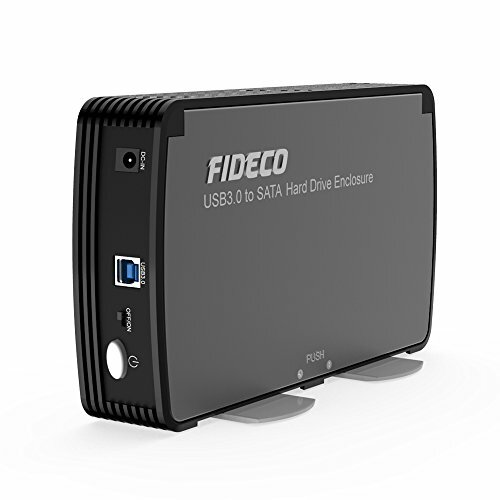 1, Connect SATA desktop hard drive externally to your computer.Transfer data quickly and easily through USB 3.0 cable. 2, The enclosure is constructed to durable aluminums and high quality plastic, to ensure that disspation, protecting your drive to overheating; and large screws make for easy assembly. 3, Aperfect solution for data transfers or data backup! - The ard drive enclosure support UASP and all 3.5-inch 2.5-inch HDD SSD SATA-I SATA-II SATA-III hard drives. - Compact and ultra light aluminium case design. - Easy access on PC or Notebook, free-tool, effortless installation, no driver or software needed. - High Speed transfer rate performance, up to 5Gbps, up to 10TB capacity. - Built-in cooling fan provides heat dissipation, reduce enclosure heat, hot-swappable. - LED indicates activity status, power switch. - Support OS: Windows 2000/XP/Vista/7/8/10, MAC OS 10 and up, Linux. Compact External Encloaure Storage: High quality aluminium hard drive case with LED indicator and power switch. Turn a 3.5''/2.5'' SATA hard drive or solid state drive (with 1.5Gbps, 3Gbps, or 5Gbps data transfer rate) into an external hard drive enclosure. Upgrade or back up your PC or laptop with up to 10TB hard drive capacity. SupperSpeed USB 3.0 Performance: Rapid data transfer rates up to 5Gbps through the USB 3.0 port with UASP (USB Attached SCSI Protocol), supports up to 10TB capacity, provides 70% faster transfers performance and 40% faster write speeds. Backwards compatible with USB2.0 and 1.1 connections. Tool-Free Effortless Installation: It is easily and fastly to install and unstall HDD SSD drvies, including two fastening pads (for secure disk positioning). USB 3.0 Gen 1 cable, compact power adapter, and simple hard drive stand (to hold the hard drive and conserve desk space). Convenienve to use and no driver or software needed. Built-in Cooling Fan Effest Designed: It supports cooling effect function for hard enclosure and HDD SSD SATA derives, to protects your hard drive from problems caused by high temperatures and extending the use of time. Broad Compatibility and Warranty: Compatibility for Windows 2000/Windows XP/Windows Vista/Windows 7/Windows 8/Windows 10, MAC OS 10 and up, Linux. We Offer Best Service: 18 months warranty and 24h friendly customer service and email support. If you have any questions about this product by FIDECO, contact us by completing and submitting the form below. If you are looking for a specif part number, please include it with your message.